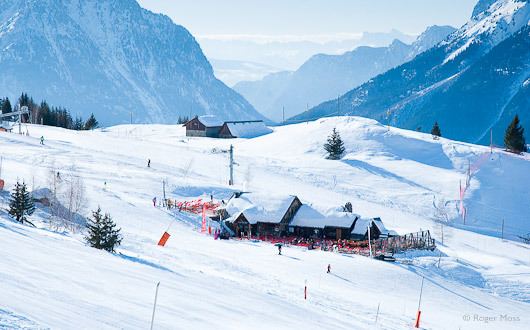 Overlooking the Winter Olympics host city of Grenoble, Chamrousse is surprisingly accessible. The city is roughly the same distance beyond Lyon as Chambéry Savoie Mont Blanc, so drive times from the UK are relatively comparable, all but the relatively gentle final climb to the resort being on fast autoroutes. Transfers from budget flights into Genoble are similarly rapid, despite usually being routed via the busy city centre for a change of coach. Plenty of intermediate groomed cruising. Ski the mythical men's downhill run from the 1968 Olympics. Safe learner area and easy progression green pistes. Ninety kilometres of groomed terrain might not look much on paper, but most of it is well-linked blue- or red-graded cruising. Blacks include the world-famous Men’s Downhill and the Couloir de Casserousse, with a vertical drop of 850m. At the other end of the scale there are gentle ski-school areas, and some worthwhile green runs for novices. 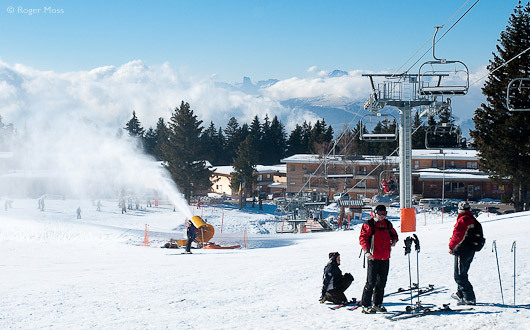 Whatever your level, Chamrousse is a surprisingly nice place to be, with sensational views higher up overlooking Grenoble and across to the Plateau de Vercors, plus more sheltered tree-lined pistes above the villages. 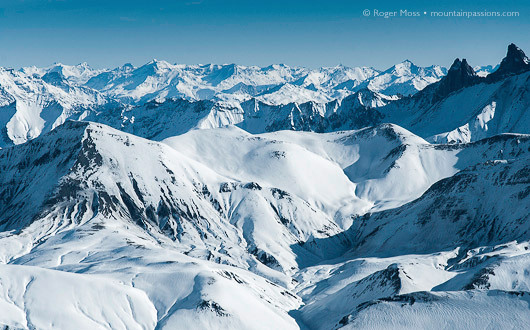 Just below them lie over 40 km of deservedly-popular ski-de-fond (cross country) terrain. From the start of the winter 2017/18 winter season a new 6-seater detachable chairlift will serve the Casserousse descent - one of the 10 mythical descents in the French Alps (chosen by the magazine "Les Grands Ducs") upon which Jean-Claude Killy won his first Gold medal at the 1968 Winter Olympics. Purpose-built ski resort close to Grenoble. An upbeat, family resort with downhill and cross-country skiing. Chamrousse comprises three villages – 1650 (le Recoin), 1700 (Arselle) and 1750 (Roche Béranger). Chamrousse 1400 is a little-developed access point at the base of the Casserousse black-graded expert terrain, while the others have the accommodation, services and main lift access. Best-established are 1650 and 1750, which so far also have a better range of services than the more recently-developed 1700 Arselle area. The villages’ respective appearances reflect their respective origins from 1950s to the present day, but an attractive contemporary style has shaped more recent development, giving Chamrousse a unique identity. Don’t expect a traditional Alpine chalet feel; for all its history, this upbeat place is much more about right now and the future than the past. 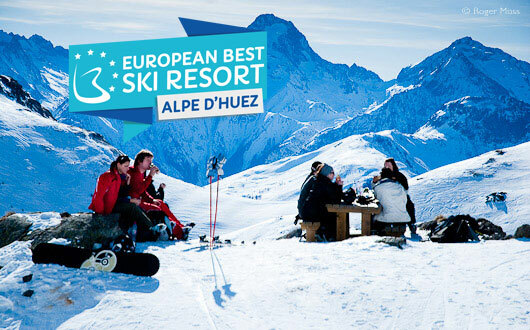 Why go skiing in Chamrousse ? There’s varied terrain for all levels and interests, making this a perfectly serious contender for most tastes. It’s therefore particularly suitable for families and mixed-ability groups, not forgetting cross-country skiers. Non-skiers should also find plenty to do, including walking, snowshoeing, ice-driving, snowmobiling, dog-sledding and paragliding. There’s a large spa and wellbeing centre, with pool, Jacuzzis, steam-rooms, saunas and solarium. Also on offer are massage and a range of relaxation and beauty treatments. Chamrousse Sunset Park has a family area in the Kid Park and elements from learners to expert standard in the Snowpark and Initiatic Park. Extensive circuits among wooded terrain. Reserved parking near the lift in Chamrousse 1650 and 1750. The best is near the gondola in 1650. Free skipass for disabled skiers and 50% discount for their companion (conditions apply). Quick transfers from budget flights into Grenoble. Plenty of accommodation for most budgets, and a friendly vibe. Recent major lift system upgrades. Southern feel to the surroundings. Modest mileage (and it's not linked to anywhere), so not one for distance fiends. 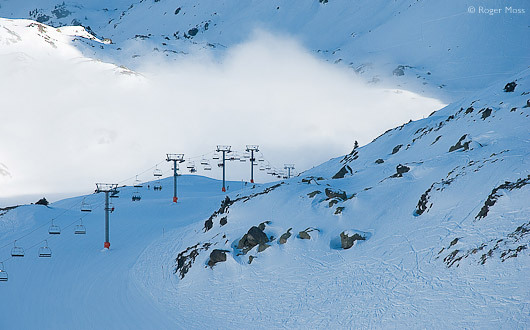 Variable snow record for lower terrain – but there's highly effective snowmaking. 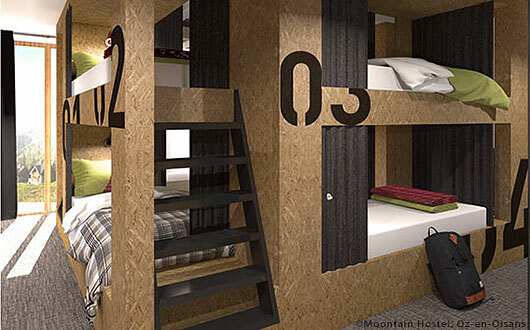 Stay in the newer accommodation for more comfort and convenience. A large development of 8 mini-villages with four or five 4 storey buildings in each, all cleverly sited amid the trees in Chamrousse 1700. The apartments are contemporary in design, comfortable and spacious. Interiors are fresh and bright, with plenty of storage space. They all have a fully-equipped kitchenette with hob, oven or microwave, fridge, dishwasher, coffee maker and a balcony – some south-facing with a large terrace. We stayed in the uppermost buildings near Reception and enjoyed amazing panoramic views. Bed linen, towels, TV and wifi are all payable extras. The area has its own shop, ski-hire, bars and restaurant. 'Le Bachat' is a friendly and modern bar/restaurant (free WiFi) nearby and serves traditional meals, pizzas or a take-away menu for those who prefer to relax in their own apartments. We found it a great place to hang out with a beer, catch up on e-mails, and enjoy the lively atmosphere. Access to the ski area is via the nearby Domaine de l'Arselle chairlift, beside a ski school meeting-point and small beginners slope. 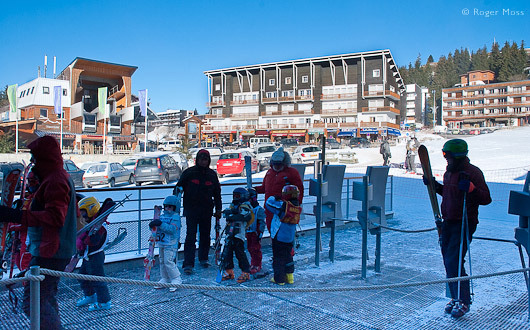 The village navette circulates regularly and will take skiers to other areas such as Recoin at Chamrousse 1650, where the new La Croix gondola whisks you to the top of the mountain in a few minutes. Specialising in regional cuisine, this cosy and welcoming Savoyard-style restaurant in the heart of Chamrousse 1650 offers fondues, raclette, tartiflette and ravioli plus a range of other dishes to suit all tastes. We enjoyed vegetarian ravioli served with cêpes under a Reblochon gratin for around €16. A plat-du-jour, including a café gourmand, costs €16.50. Take the A48 from Lyon or the A41 from Chambéry Savoie Mont Blanc to Grenoble. After the péage stay on the ring-road until exit 2 towards Gières and Uriage. Follow signs for Uriage where you have a choice of two routes up the mountain to Chamrousse. For Chamrousse 1650, it is shorter to take les Seiglières which is left at the first crossroads, and for Chamrousse 1750 take the second route via Prémol / Luitel. You can access both areas from either road. Grenoble-Isère airport is the closest. There are shuttle services from the airport to Chamrousse provided by Ben's Bus or Actibus. Chambéry or Lyon St Exupéry or Geneva are good alternative airports from which you can transfer to Grenoble bus station to catch the regular Transisère bus service to Chamrousse. Take the direct fast train (TGV) Paris-Grenoble (3hrs). The station is 30km from Chamrousse so you will need to arrange a transfer by bus or taxi if you are not hiring your own vehicle. The route up from Grenoble, via Saint-Martin d’Uriage, feels increasingly further removed from the bustle of urban life down below. In fact, driving the forested upper sections remind us of similar wayward approaches to ski areas in the wilds of western Canada. We find that pretty encouraging. Eventually we pass large groups of cross-country skiers heading back to their parked cars near the Domaine Nordique (cross-country skiing) lift-pass office, a sign that we’re almost there. Things get a little confusing when we encounter signs to the various ski villages, but we make it to our base in Arselle with no real problems. Low-rise, timber-clad apartment blocks set among pine forest make this an attractive development, not least since it offers us sweeping views to ski-de-fond clearings and the mountains beyond from our apartment’s large, south-facing balcony. We awake to find a veil of cloud drifting lazily across the valley below, bringing a magical sense of detachment to the mountains. Snow-making ensures the safe beginners slopes are always available. The following morning we awake to find a veil of cloud drifting lazily across the valley below, bringing a magical sense of detachment to the mountains. While Gronoble is no doubt overcast, up here we’re going to be skiing in bright sunshine. Better still, despite bitterly cold temperatures there’s barely a breeze, which is good news for snow conditions. The Arselle chairlift hauls us rather sedately from beside the ski-school area up through the pines to join the blue-graded Bachat Bouloud piste serving a chairlift whose name it shares. This second lift gets us rather higher, and a little closer to the heart of the ski area, from which – if they plan their route on the piste map – intermediate skiers can head all the way round to Chamrousse 1650 without taking another lift. For now, though, we’re happy to work our way around while seeing what’s on offer above the villages. A gentle run down Perchette, a cruisy blue-meets-green piste, brings us into Chamrousse 1750 – a popular spot with a débutante area, two chairlifts and a nearby pair of draglifts. We take the high-speed Bérangère chairlift, which gets us even higher but still little more than half-way to the 2250m summit of La Croix. We exit the lift onto the upper Liaison Roche-Recoin blue piste, to join the red-graded Schuss des Dames. By now visibility is failing as the cloud in the valley has crept higher, but the run is easy to follow as it snakes and swoops around the craggy contours of the mountainside. We have a ball in the misty silence, and are tempted to continue all the way down to a pair of draglifts for a haul up to do it all again. Or maybe ski Fusée, the run’s blue-graded counterpart. In fact, we do neither, instead peeling off before the lowest section onto another useful link-run, the pleasingly-named Traversée du Rat (‘Rat-Run’), which fires us onto the red-graded Jardins. This long, relatively gentle traverse brings an opportunity to drop down to another high-speed chairlift (Gaboureaux) – take this and you can transfer half-way up the mountain to the Les Amoureux, another high-speed chairlift heading up to La Croix. Alternatively, you can do as we do and carry on down into Chamrousse 1650. The village originally developed around the La Croix cable-car, which took skiers all the way to the top of the mountain in a single haul from 1953 until it was replaced by a high-capacity gondola lift in 2010. The base station is now regarded as something of an historic monument and is preserved, unlike the top station, which disappeared during re-landscaping of the prominent site. 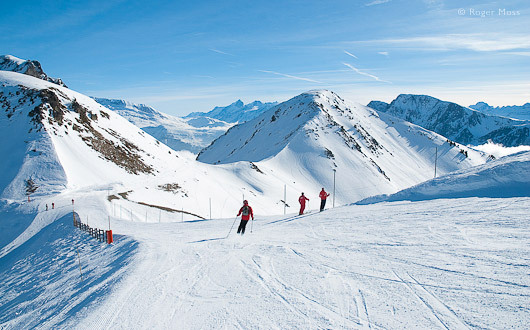 Skiers admire spectacular views towards Les Grandes Rousses and Oisans mountain ranges. The red-graded Lacs Robert piste and its chairlift. By now the sky is clearing, so we board the gondola to enjoy the views during the smooth ride to La Croix. Stepping out again into temperatures of around -12C has real shock-value but the panoramic, above-the-clouds views are sensational. From here there’s a long, long blue-graded descent which with a bit of careful navigation would take us all the way back to our base in Chamrousse 1700. But there are other options. We haven’t come all this way simply to head back to the apartment just yet, so we decide to press on beyond La Croix to the Lacs Robert piste, which although steep is actually one of the easier reds we’ve skied. All the same, it kicks off in style – to our right are spectacular views towards Les Grandes Rousses and Oisans mountain ranges, while falling away to our left is the huge snowy bowl of Les Lacs. After a photo pause we make the left sharp turn and tackle Lacs Robert, which falls away steeply before easing slightly at the turn-off point for the Couloir de Casserousse, an epic, black-graded descent to Chamrousse 1400. Snow conditions have closed during our visit, but we’re now skiing beneath the return chairlift. As we approach the bottom of the run we’re surprised to see ahead of us a large army camp beside a group of snow-covered small lakes. It’s a bleak and inhospitable spot and we’re genuinely impressed by the troops’ hardiness, but are happy to be joining the lift and heading back up into the sunlight. By now we’re growing hungry too, so from La Croix we ski the top section of the Olympique Dames black piste before transferring to the red-graded Simond for most of the remaining run down into Chamrousse 1650. 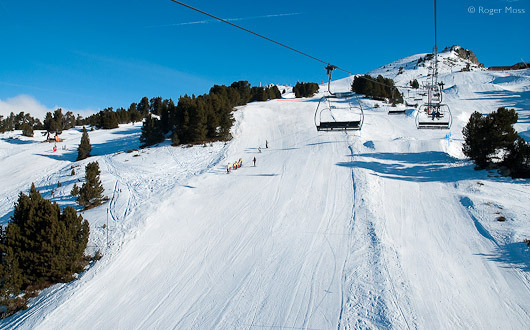 Chamrousse 1650 is home to the celebrated Olympic pistes from the 1968 games. 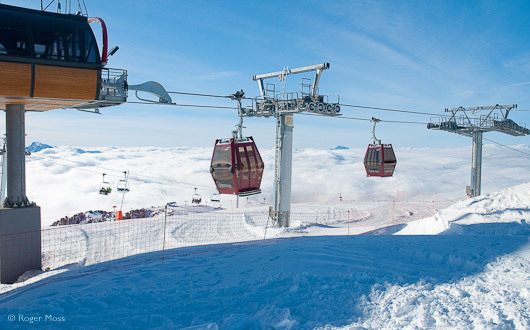 Access the pistes from the summit of the ski station at the Croix de Chamrousse. The mythical men’s downhill, won by Jean-Claude Killy, descends to the lowest point at Casserousse (1400m) and is served by a recently built 6-seater chairlift. It's a few steps from Chamrousse 1650 to join the lift. Young skiers getting instruction on one of the broad pistes at Chamrousse. After the glacial cold, our relaxed and later than planned lunchtime interlude at Les Gaboureaux feels so pleasurable that leaving afterwards requires a significant degree of willpower. Fortunately it’s just a few steps back to the gondola lift. At the top that long cruise over towards the apartment has now started to sound like a really good idea, so we schuss off lazily on the well-named Crêtes. The blue-graded piste follows a long ridge overlooking more fantastic scenery, before steepening a little for the run down to the top of the Bachat Bouloud chairlift. From here we see another side of the area’s personality, and cruise in wonder through a landscape whose wild, craggy beauty feels for all the world like that of northern Provence. We’ve had that feeling before, over at Villard de Lans in the Vercors, but here it’s totally unexpected, adding the perfect final touch to an already great day’s skiing. Minutes later we slip beneath the road bridge connecting Arselle with the neighbouring villages, and know we’re almost home. Sure enough, we recognise ahead of us the novice area from which we set out this morning, and from which a few minutes’ walk will take us back to our apartment. 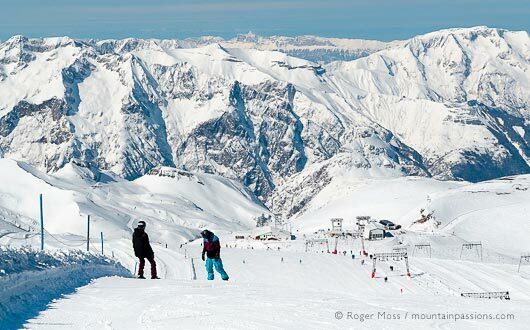 Whatever we were expecting, Chamrousse has surprised us in many ways, not least by proving that the most enjoyable and affordable family skiing isn’t always the hardest to reach.